West Ham have accused the Premier League of ignoring their own rulebook because the League have said they won’t oppose a move by Tottenham from north to east London if Spurs’ bid for the 2012 Olympic Stadium is successful. West Ham will seek a judicial review if Spurs get the ground instead of them, according to secret legal papers seen by Inside Sport and by sportingintelligence, which publishes details here today. A series of explosive letters, all sent in the past fortnight, lift the lid on the acrimonious row over the venue, which West Ham and Spurs both want. In the letters, from West Ham’s lawyers, the Premier League are effectively accused of failing to undertake any assessment of the impact of a move by Tottenham away from their historic White Hart Lane home, either on the clubless area left behind in the borough of Haringey or on the various clubs whose ‘patches’ would be impinged on by Spurs. West Ham are most opposed to Spurs moving nearer to them, but Leyton Orient, Millwall, Dagenham and Redbridge and Charlton could all suffer from a big-name rival being parachuted closer. Premier League rules (link to PDF of the rule book here) say club relocations must not damage others. The specific rules governing club grounds are in section I, and the relevant clauses about ‘appropriate location’ and about adverse effects on other clubs, are I.6.2, and I.6.5, extracted below from page 128 of the rules. One letter from West Ham’s lawyers to Mike Foster, general secretary of the Premier League, says West Ham became aware by letter on 10 December that the Premier League would not oppose Tottenham’s move to the Olympic stadium, if Spurs’ bid were successful. 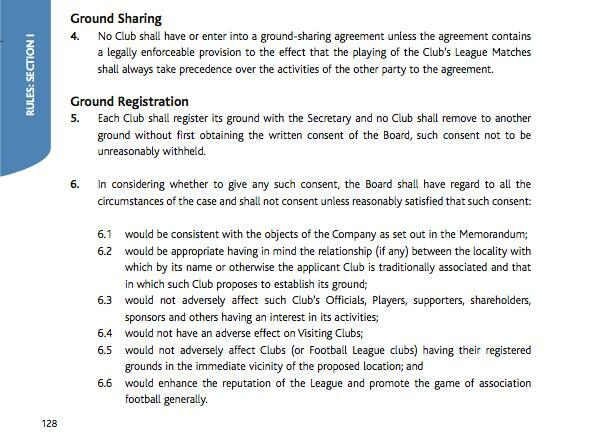 “We would refer to Premier League Rule I.6 which states that, in considering whether to give any such consent, the [PL] Board shall have regard to all the circumstances of the case and shall not consent unless reasonably satisfied [that a move is appropriate and won’t damage any other club],” that legal letter says. It continues that West Ham would expect the Premier League, prior to any such decision, to consult “amongst others, the Metropolitan Police, the London Borough of Newham, Transport for London and WHU’s supporters. We do not have any indication that any such representations have been sought. The letter ends with West Ham stating that a request for a judicial review is within the club’s rights, and sportingintelligence has learned West Ham will seek that review if Tottenham get the stadium with no Premier League impact study having been done. Tottenham say rebuilding a new ground at White Hart Lane will cost £450m, whereas they know a new home in East London will cost half that, perhaps less, as well as bring in naming rights riches that a new ground at White Hart Lane won’t bring in. For that purely financial reason, moving to the Olympic site makes sense to Spurs’ bottom line. But there is also a concern that Spurs’ owners want that move to increase the club’s value to they can sell soon at a big profit – something Spurs deny. Tottenham’s bid to move east also faces vociferous opposition from the leader of Haringey Council, Claire Kober, and their own MP, David Lammy, both of whom have separately written to the League to ask why they would not oppose a Tottenham move. Lammy’s letter makes reference to MK Dons, suggesting a Spurs move to the East would be little more than a franchise relocation akin to Wimbledon’s. “We are therefore very surprised to see recent media reports that have suggested the Premier League Board have confirmed to Spurs that the proposed move to the Olympic Stadium would not contravene Premier League Rule I 6. I would be grateful if you could clarify the position of the Premier League with regards to this issue. A Spurs anti-move group, We Are N17 — slogan ‘No to Stratford Hotspur’ — argue that any Spurs move to the Olympic site would be akin to the hugely controversial ‘Franchise FC’ move of Wimbledon in 2003 to become MK Dons in Milton Keynes. The Olympic Park Legacy Company will choose between West Ham and Spurs later this month. The battle for the right to the site will intensify in the coming weeks, and sportingintelligence can reveal that the Spurs campaign is expected to wheel out the veteran top-class spin doctor, Mike Lee, to argue their case in the next few weeks. Lee is a former Premier League political strategist and spokesman, a former Uefa spokesman, and was a key player in winning the Olympics for London and for Rio, as well as the 2022 World Cup for Qatar. He is also a former West Ham director.